October 31st: "American Wolf: A True Story of Survival and Obsession in the West," contains all that and more, set around the story of one particular Yellow Yellowstone National park wolf named 06. October 29th, California: The Department of Fish and Wildlife said they would not step in unless the coyote became a threat to public safety. Then Wildlife Care of Southern California, a non-profit, based in Simi Valley specializing in treating coyotes for mange, came to Bakersfield to treat the wild animal. Many local citizens had been concerned about the animal's condition and had asked for help. The group says they want to continue watching the coyote to make sure everything is OK.
October 26th, Oregon: A trio of cattle deaths in the Fort Klamath area earlier this week are being blamed on the Rogue Wolf Pack. The remains have been sent for examination before an official determination is made. October 26th, Washington: The state Department of Fish and Wildlife says it documented another wolf depredation on Tuesday, bringing the total to 16 attributed to the Old Profanity Territory pack. The state has decided to kill the remaining two wolves from the pack. Many believe the Profanity pack has been set up and sold out. October 25th, Michigan: Now that the first wolves from Minnesota have been relocated to Isle Royale, officials plan to relocate several gray wolves from the Canadian province of Ontario to Isle Royale National Park this winter. 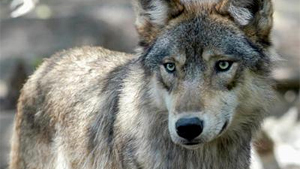 It's the next step in rebuilding the depleted wolf population at the Lake Superior park. October 25th, Michigan: All of the wolves on Isle Royale are moving about and exploring the island, as evidenced by GPS collar data. The three new females and one male wolf were trapped in Minnesota and brought over as part of a plan to bolster the island's dwindling predator population with up to 30 new wolves in the next few years. October 21st: Although exact numbers will never be known, it is estimated there were at least 400,000 grey wolves in what is now the lower 48 states when Europeans arrived, but by 1930 that number was very close to zero, including in Yellowstone. 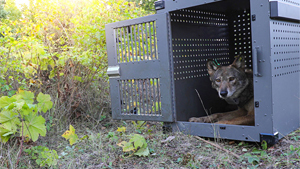 After numerous court battles, wild wolves were collected in Canada, put into large crates, and carefully taken to Yellowstone, as well as several locations in Idaho. October 20th, Florida: A wolf, named Tahane, that escaped from an educational facility in Florida after Hurricane Michael ripped through his habitat, has been found . Once Tahane’s owner arrived, the wolf came to her side immediately and the pair was safely reunited. October 18th: The Arizona Game and Fish Department announced this week that male wolves belonging to the Bear Wallow and Saffel packs were found dead in Arizona in September. The packs are known to roam parts of Arizona's Apache-Sitgreaves National Forest. October 1st, Washington: The Department of Fish and Wildlife says a marksman shot an adult female wolf on Friday. The Center for Biological Diversity says the killing of wolves is senseless, and this is the fourth pack the state has decimated to protect the cattle of one rancher. October 1st, Michigan: Two new wolves have been introduced to the island after being caught on tribal land in nearby Minnesota. The project is being done to bolster the island's wolf population, which had dropped to just two predators in recent years.